Summary: This Full Moon in Gemini supports the Heart’s work to show itself clearly as one who reaps a bountiful harvest from the seeds sown by its Will. This support facilitates separating mental initiatives from the Will’s integrated steps forward, and validates the presence of inner qualities that have matured well in their own time. How could this Full Moon offer so much while the central card of this spread shows scattering of the Heart’s core identity (Sun in Gemini)? Bad cards can fall in great places, that’s how. 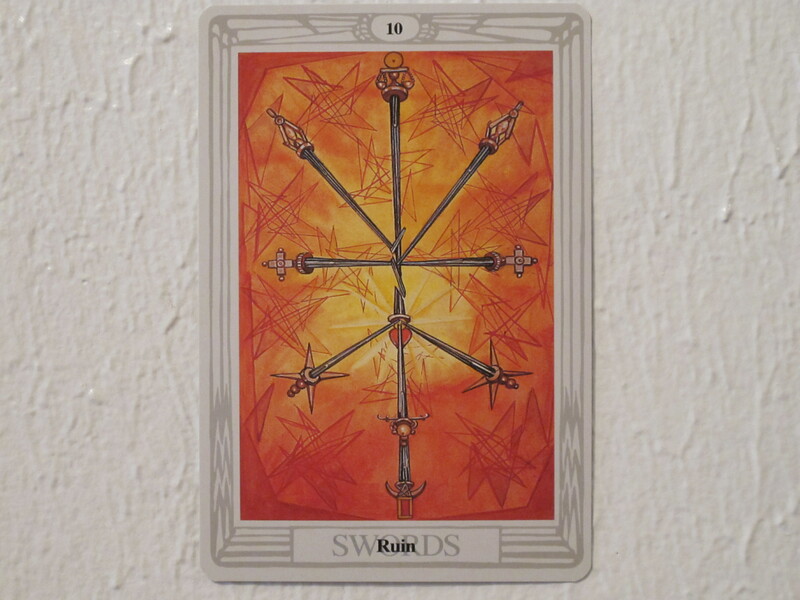 In the 10 of Swords, the white glow of the Sun and its red and orange rays peers through ten swords whose only unified force is to pierce an image of the Heart from all directions. 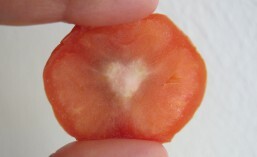 This shows the Heart’s warm, living Will shining forth abundantly, but then being dominated by mental activities. For example, over time, civilization, culture, family, politics, social media, and the presence of raw talents develop and sustain mental activities. The mind then makes simple plans to use those abilities. However, in the 10 of Swords, this planning goes overboard, and invades the Heart’s domain. The Heart “plans” on a greater scale, in that it orchestrates a flexible agenda and a multi-faceted identity so that life can be graced with an ongoing, beneficial momentum. When the mind overtakes the Heart and leans on its own initiatives in place of a solid identity, there is little stability. Accordingly, a ten of any suit in Thoth Tarot is the unstable opposite of the Ace of that suit, and the pendulum is about to swing down from that extreme towards a point of balance. This Full Moon offers to re-establish that balance for the Heart. Looking to the left of the central card, Trump I supports the Heart’s true will directly. Trump I shows the Greek/Roman god Hermes/Mercury; it represents the first alchemical element Mercury which is a dynamic, transmitting substance; and it is about the Will of the Magus. The Magus (magician) is a high spiritual attainment in the Hermetic Order of the Golden Dawn. 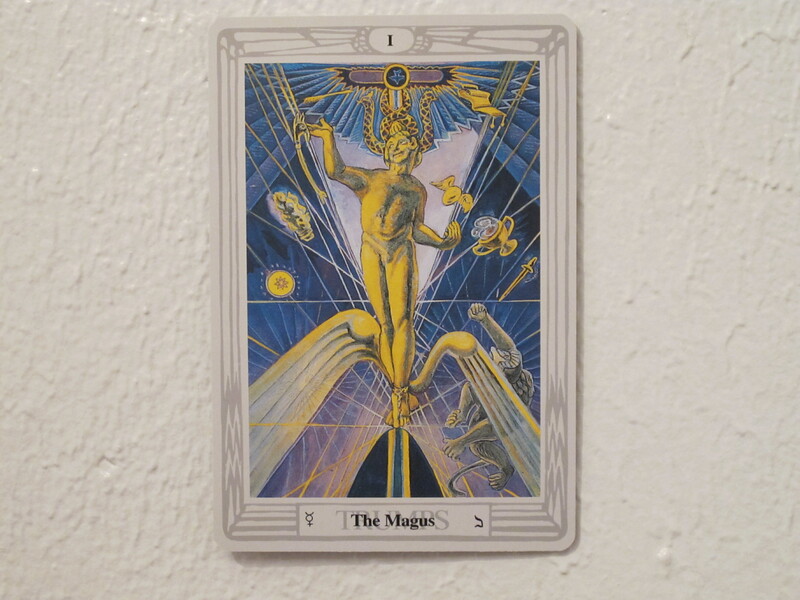 Aleister Crowley, who envisioned the Thoth Tarot deck, worked through the Golden Dawn’s degrees including the Magus, and developed the imagery of this card through vision quests. In the context of this spread, the Will of the Magus appearing here creates a safety net as the wily mental processes fail to provide stability. It shows that the Heart adeptly juggles maturity (symbols of each earth element), and wields healing powers (large caduceus behind Mercury). 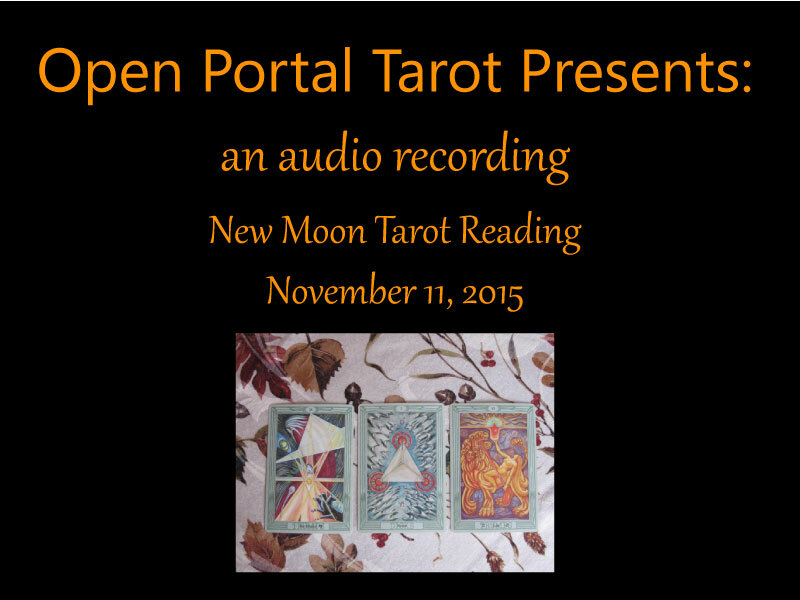 It also shows a winged egg (fertility and potential) looking to land in the Magus’ space. These qualities comprise the wide open yet solid sense of identity that the Heart in its wisdom creates. Meditating and journal writing on this card would interrupt the unstable mental arrogance and reinforce the validity of the Heart’s Will. As an act of infinite compassion, this Full Moon also supports the Heart’s battle with mental arrogance by drawing attention to the plentiful harvest surrounding the Heart’s recent work. Somehow, the mind may have taken credit for the harvest, or considered it random luck. In the context of this spread, any current bounty is the natural result of divine grace flowing through the Heart’s Will. When asked, the Heart would utter gratitude and readiness to serve others with the resources. 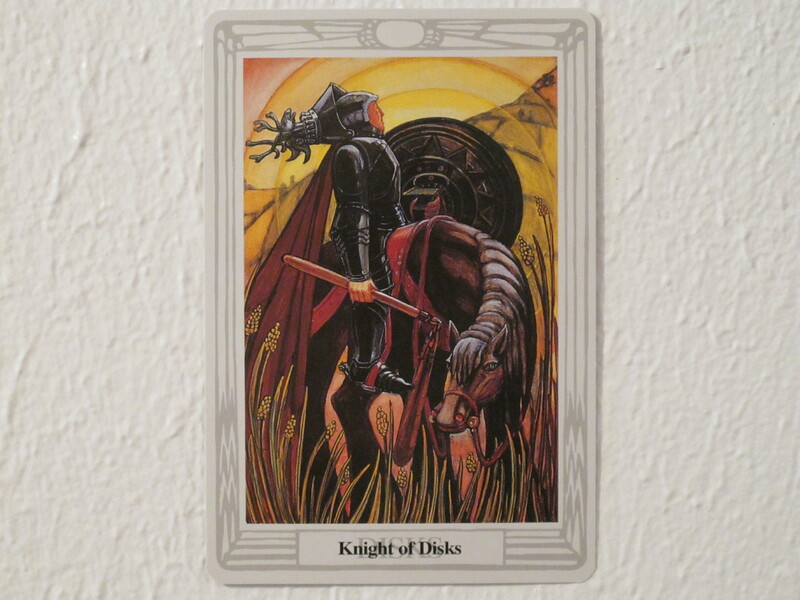 The Knight of Disks to the right of the central card shows a knight mounted on a horse, both of whom are focused on leading a harvest, not a battle. The knight holds a serviceable flail for threshing wheat, not a sword. His shield can double as a big plate to feed the multitudes. His kind-eyed horse sniffs the sweet, ripe grain. If out of ignorance, the mind feared the Heart’s Will, this Full Moon points out through the Knight of Disks that the will of the Heart not only creates substance and meaning, but also understands its connection to the Earth enough to create resources for itself and others (Will under the law of Love). Meditation and journal writing on this card would remind one of all life’s blessings, ground one’s creative potential in the Earth, and lighten the weight of the world on one’s shoulders. May the Moon be welcome on the altar of gratitude for this year’s harvest. May other saints, prophets and guides be equally welcome. May the Heart’s overflowing gratitude be heard and received. May the Heart continue to flourish as a being of high spiritual attainment. May it continue to build a nest for future creativity. May food, shelter, and natural resources continue to support life. May mental processes clear away arrogance and allow the Heart’s will to work its magic. May it be so for you, dear reader. May it be so for me. May it be so for all our close companions and fellow humans with whom we share the Earth. This entry was posted in astrology, full moon, spirituality, tarot and tagged 10 of Swords, astrology, Knight of Disks, spirituality, Sun in Gemini, Thoth Tarot, Trump I. Bookmark the permalink. It is an interesting Moon!